Still, it was a special moment seeing Tom switch out Kevin's neckerchief for the new plaid one he will proudly wear as he earns the requirements for Webelo. He will be a Webelo his last two years of Cub Scouts before he crosses over into Boy Scouts. I am proud of our new Webelo! 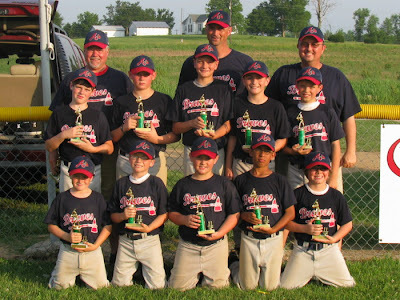 In other great Kevin news... Kevin's baseball team (finally) won the "opening weekend tournament" that started in mid-April. We just finished it last weekend - on June 5! We swept the tournament. The boys are also on their way to an undefeated season. Go Braves! In Amy news, I am sure enjoying my summer break with my guys! Hooray for Kevin! 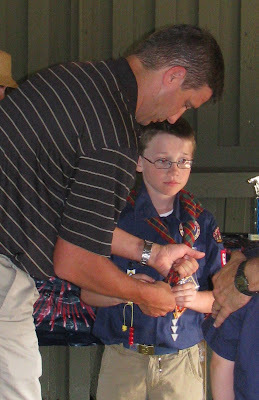 That totally cracks me up about Webelos . . . 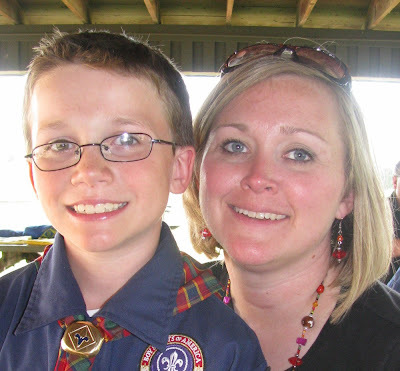 I have a little boy who is starting scouts in the fall. They grow up too fast!